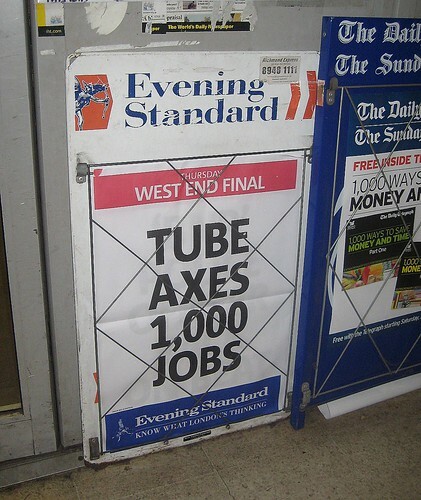 Looks like the doom and gloom of the recession has finally hit the Tube as London Underground announce that 1,000 people will lose their jobs. 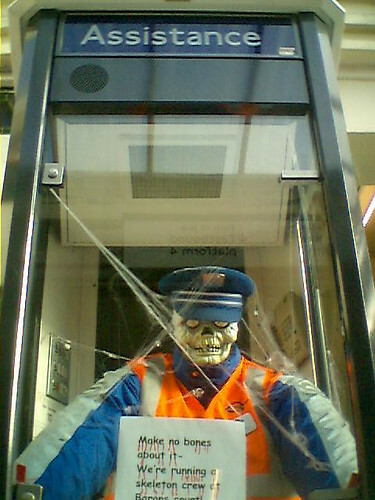 Unlike the picture of skeleton staff above implies, LU said no front line staff or Tube drivers, would be out of a job, the cuts would be from temporary and administrative posts. However, as we'd probably expect with the railway unions, they are saying they will fight the cuts, as they believe the reduction in jobs will lead to a reduced service. 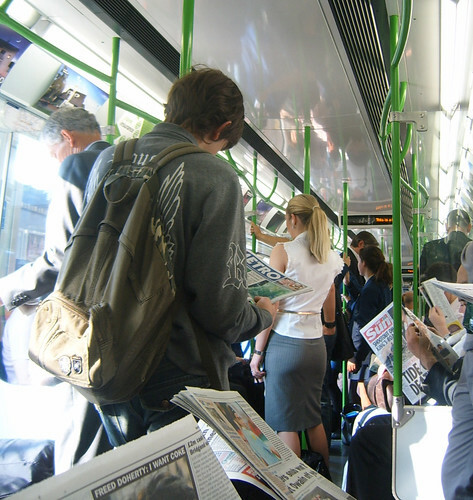 Gerry Doherty, leader of TSSA, said: "This is a real body blow for staff and the London travelling public. There is no way that cuts of this size will not hit services. 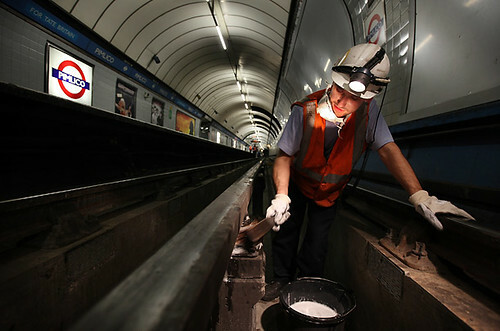 We should be investing in the Underground in the run up to the Olympics, not cutting back." Bob Crow, leader of the RMT, was more bullish and hinted at strike action as a result of the announcement: "Any attempt to impose compulsory redundancies among our members or to undermine their terms and conditions will be met with a ballot for industrial action." He added "Once again it seems if you are a banker you get protection, but if you are part of a team providing a public service you don't. There is no way that London's transport workers should be made to pay for the failure of the bankers and privateers whose greed has created the crisis our economy is now in." He also agreed with Doherty by saying "There is no way that redundancies on this scale can be implemented without affecting the level of service. If the mayor is looking for efficiencies he should bring the Tube Lines PPP contracts back in house, because they are still draining huge sums of public money from London’s transport budget." 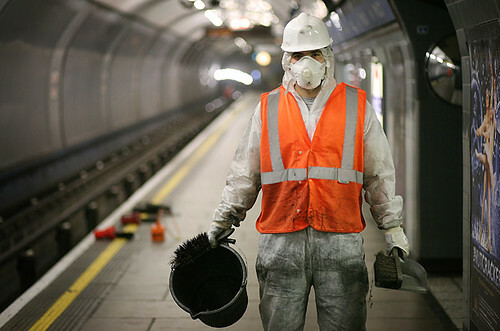 The London Underground employs about 20,000 staff, and the jobs which are slated to go are from finance, IT, procurement, human resources, legal and administration. For once I tend to agree with Bob Crow (well not about the threat of strikes bit, which he plays too often). I find it hard to see how an organisation can lose that many staff - in whatever functions - and for this to make no difference to the service it provides to the public. 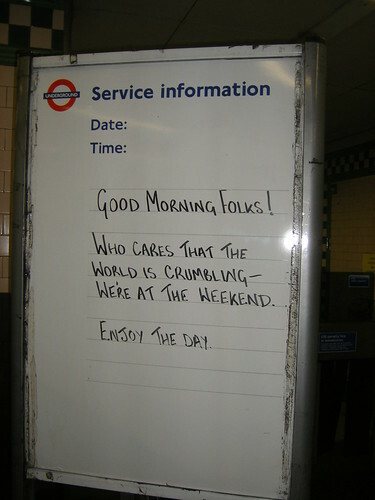 Spotted by the lovely Melanie Seasons this morning at Warwick Avenue Tube. She said "The man who works there in the morning always writes the most ridiculous happy-go-lucky messages on the status board and I finally caught one.". I wish this had been made into an official poster for the London Underground. 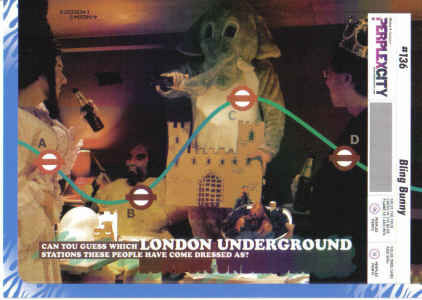 The cartoon postcard below from the London Transport Museum deals brilliantly with two common Tube complaints. Standing on other people's feet when it's overcrowded AND the hot potato about giving up seats. 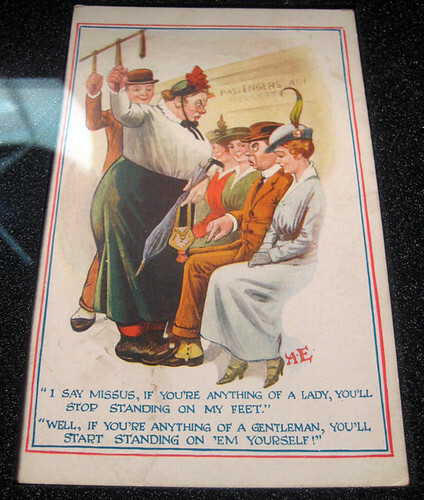 The disgruntled gentleman seated is moaning as a woman is standing on his feet. "I say Missus, if you're anything of a lady you'd stop standing on my feet". The lady gives back an answer that I'd love to have given myself. "Well, If you're anything of a gentleman you'd start standing on 'em yourself". So even in Edwardian times, it certainly wasn't given than a man would give up his seat for a woman. I don't expect to be given a seat on account of being a woman, but I if a man offers me a seat (which happens occasionally), I'll gladly take it. I don't know if that makes me feeble, but it's nice that some old fashioned courtesies still exist. However, I know that a number of men say they won't give up their seat, as they're worried that women will take offence. I think this is mainly down to the dilemma of suggesting that you're only giving up your seat because you think the woman's pregnant. I wonder if the Edwardian postcard approach would work any better than TfL's current Considerate Londoner / Together for London campaign? There is a poster in the series above which has one of the numpty cartoon characters saying "I'll offer that person my seat" and a female numpty saying something like "I'll politely take it". It's trying to promote a little give and take or to quote the campaign: "A little thought from each of us, makes a big difference for everyone." Maybe they should test a more humorous or blunt standpoint as seen in the postcard, unless that would lead to even more raised tempers! Why don't more couples take a leaf out of the book of this pair? This Monday morning on a packed Piccadilly Line, instead of taking up two seats, this guy and girl shared a seat and had a cosy read of Metro. A nice public display of affection on the London Underground that didn't make the rest of us feel like saying "Get a room". If only they had sat under the above sign promoting peak hour sitting (spotted by Whatleydude) the picture would have been perfect! 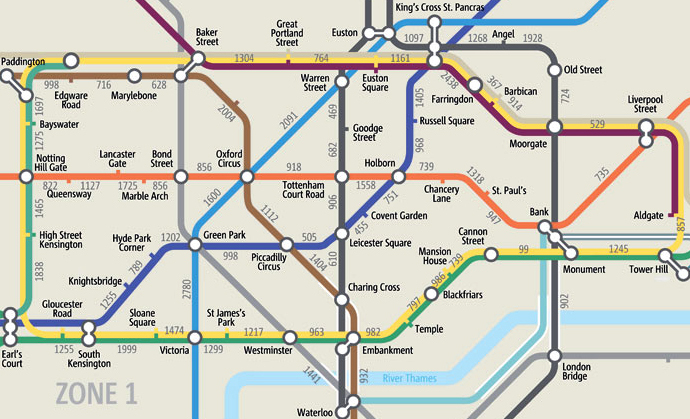 The London Underground have launched two maps that will show you where to spend a penny and where you won't have to climb stairs when using the Tube. 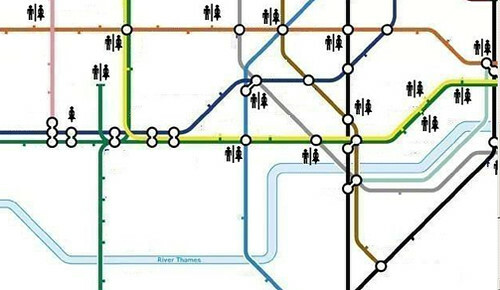 "The Tube Toilet map shows which stations have male, female and accessible toilets for wheelchair users, whether they are inside or outside the ticket gates, and whether they have baby changing facilities. The Step-free Tube Guide gives information about the step and gap between the train and platform at step-free stations, and gives information about the stations where you can change between lines without encountering steps or escalators. This guide will also help passengers with heavy luggage or those with children's buggies." said TfL on their site. These are great moves forward with the map and very much like the idea explored with AccessCity. Still at beta stage it was one of the finalists in Social Innovation Camp (which I've actually been trying to get in front of the powers that be at TfL and Tube Lines). Thanks to Kevin from Travolution for giving me the heads up on the new maps. When looking at the map, it was surprising (for me anyway) to see how little of the London Underground was actually step free. What's also interesting is that people on the net have been playing about with maps like the above for years, and yet TfL have only just got round to officially producing them (better late than never). 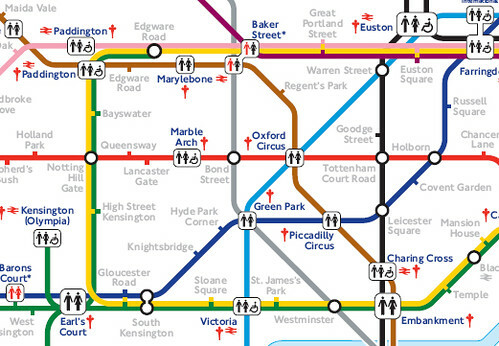 Geoff produced an unoffical map with toilets on it in 2007 (admittedly to help those doing all day Tube challenges) and Last Rounds Project has an interactive map showing which Tube stations have public toilets near them. Hopefully, TfL will have less of a "down with this sort of thing" approach to unofficial maps and look on them as ideas which the public might actually find useful. They (sort of) gave us that impression at the blogger's briefing last year. Are there any other versions of the Tube map you would like to see? 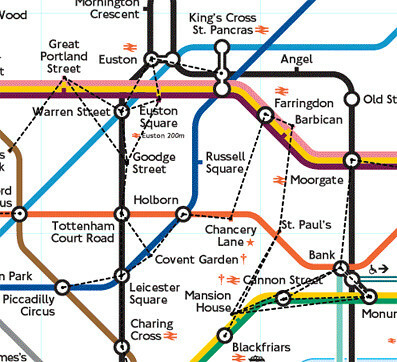 If you had design freedom & the sky was the limit, what would you find useful on the London Underground map? I really think that the Way Out Tube map, which shows you where to get on to get off (so to speak) should be a free map. It's helped me shave several minutes off my journey and when you're in a rush every minute counts. Many of you will have heard about The Atheist Bus, or rather the bus advertising campaign that was paid for by people who don't believe in God's existence. You might have also heard about the bus driver - Ron Heather who refused to drive a bus with the advert on it. 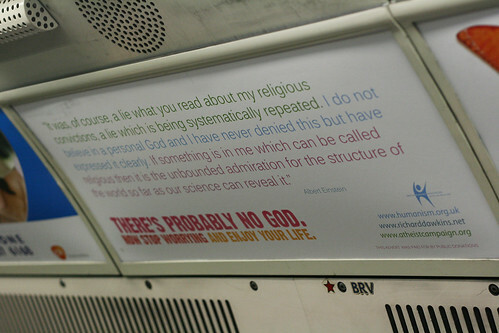 Well, thanks to Bloo Phoenix I saw that the atheist campaign has got past the powers that be on the London Underground too. Rather amazingly First Bus said it would do everything in its power to ensure Mr Heather didn't have to drive the buses with the advert on it. First Bus said: "As a company we understand Mr Heather's views regarding the atheist bus advert and we are doing what we can to accommodate his request not to drive the buses concerned." 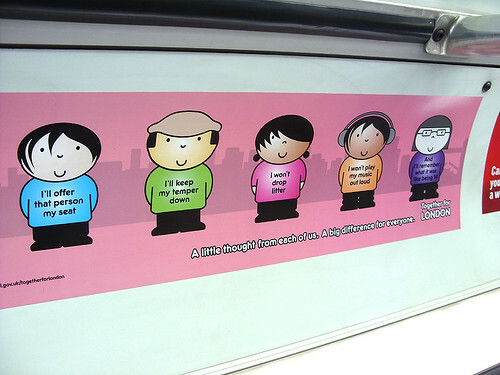 "As an organisation we don't endorse any of the products or sentiments advertised on our buses. The content of this advert has been approved by the Advertising Standards Agency and therefore it is capable of being posted on static sites or anywhere else." Now isn't this setting a worrying precedent? Do you think that RMT leader, Bob Crow will get Tube drivers up in arms and suggest they refuse to drive London Underground trains with ads in them they don't like? 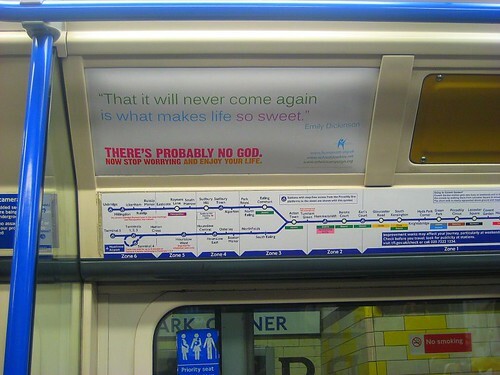 I've seen ads for all sorts of religions & belief systems inside Tube carriages and I'm sure there are plenty of people (including Tube drivers) that don't agree with the sentiments on the advertisements. 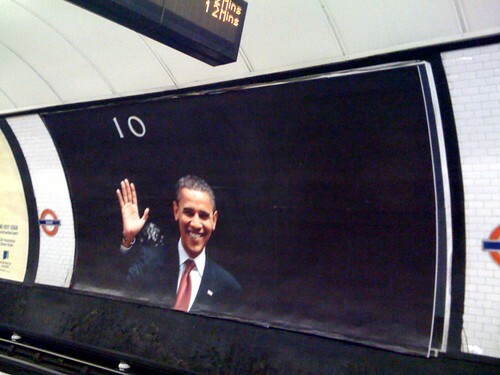 What about entire London Underground trains that are covered in adverts? Wouldn't it be a bit weird for TfL to say "Ah that's alright, you don't agree with London having the 2012 Olympics, so we'll let you off driving the Tube today"? Like how this one is less Dawkins driven and a lot more positive & life affirming, but I suspect it still wouldn't make Mr Heather and many others happy. January's the time of year when memberships to gyms rise and more people resolve to get active to work off their Christmas grub. So it's no surprise to see the launch of yet another London Underground map to encourage us walk between stops rather than take the Tube. PruHealth got together with a team of volunteers with pedometers to count the number of steps between Tube stations in zone one and plotted them onto a map. The BBC report that: "the average person would take 99 steps in walking between Cannon Street and Monument stations and 2,438 steps from King's Cross to Farringdon. The British Heart Foundation recommends walking 10,000 steps per day. PruHealth said it would take the average person 75 minutes to walk that number of steps, but it would help protect them from stroke, diabetes and some forms of cancer." This had the average times to walk between stations on it, rather than the number of steps. 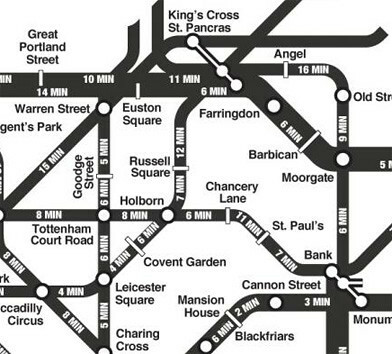 Back in 2003 rodcorp came up with an idea of a map showing walkways between Tube stations showing where it's "quicker to walk on the Tube map". I suppose that TfL would never be able to agree on what "average" walking times were. 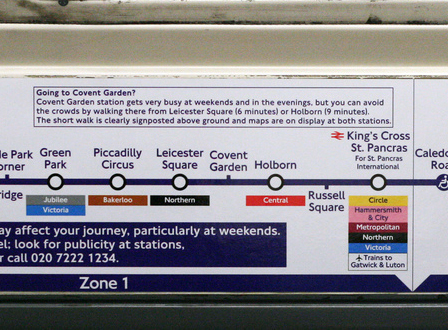 Although they do deliberately encourage people to walk between Leicester Square and Covent Garden or Holborn and Covent Garden, rather than travel the one stop by Tube. The students seem to be much more optimistic than TfL with the walking times between those stations. 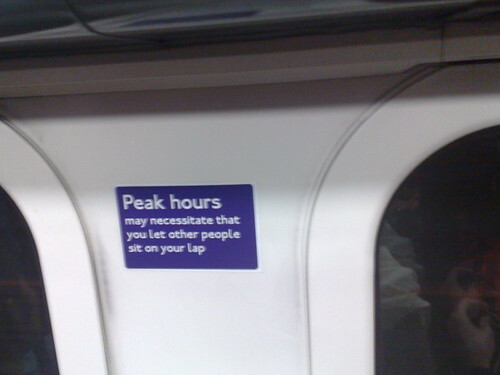 Admittedly, the Tube have those signs as an effort to reduce congestion and not a health kick. There must be many other journeys like this on the Tube, but I've never seen "walk rather than travel by Tube" displayed on any other in carriage maps. Maybe PruHealth should be encouraged to sponsor an official Tube pocket map, which would give loads more awareness to their campaign. Who saw docu-drama Stockwell on TV? I'm kicking myself that I forget to record last night's factual drama Stockwell. This is all the more annoying for me as earlier that day I attended an Amplified09 discussion about the Future of Online Video. I remember saying that I couldn't remember the last time I used my VCR and that commonly people want to watch more TV on demand on a variety of devices. It will be one of those programmes that I'll end up watching when it becomes available online on ITV1's iPlayer (but normally I'm old skool and prefer to watch anything over 15 minutes from my sofa. But I digress, Stockwell, was going to be a fairly emotive film as no one still really knows the catalogue of events and errors that led to shooting of Jean Charles de Menezes in a Tube carriage at Stockwell London Underground, after he was mistaken for a failed suicide bomber. The press release says "Based on the evidence given during the criminal trial and inquest, the hour-long programme recreates the actions of the police surveillance and firearms teams in the hours leading up to the innocent 27-year-old's death. 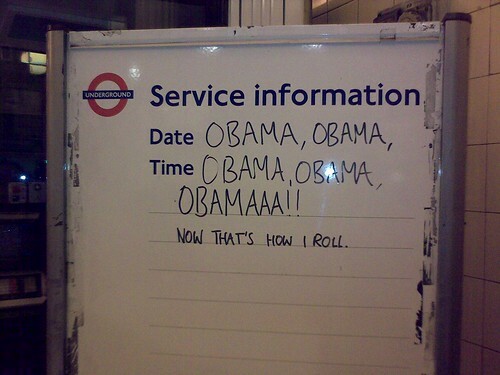 The programme opens on the Stockwell Tube with the sound of screaming and chaos. As undercover police officers charge into a waiting train, people can be seen running from the carriage." But the belief was wrong, and even now we don't know exactly how they acquired it. Who should be blamed for the shocking delay, and who (if anyone) positively identified de Menezes as the bomber? Stockwell did not guess, but subtly led us to the correct inference that someone at the Met has something to answer for. So, despite the odd melodramatic flourish, this was public service broadcasting in the true sense of the term – and a very fine piece of work.."
I would love to know if anyone watched it last night and what you thought of it. As the film is based on evidence from the criminal trial and inquest, I wonder how many of you will make similar conclusion to the Telegraph reviewer? "So why was Stockwell shocking? The answer is that – forgive the cliché – it turned 'unknown unknowns' into 'known unknowns'. Perhaps it's just laziness on my part, but I find it hard to visualise detailed media reports of events as complicated as this one. Until last night's programme, I didn't know how many questions about that morning remain unresolved. Now that I do, I can understand why the anger surrounding this case refuses to die down." If you're in the UK you can watch Stockwell on ITV player it's on their site for the next 30 days. At the London Transport Museum last week, I saw an amazing print of how the London Underground & transport in London might look in the future. It was drawn from around 1790 - 1830. Unfortunately I can't remember the exact date and who the artist was (if someone knows can they let me know), but I love seeing people's visions of the future from hundreds of years ago to compare with how things really are now. 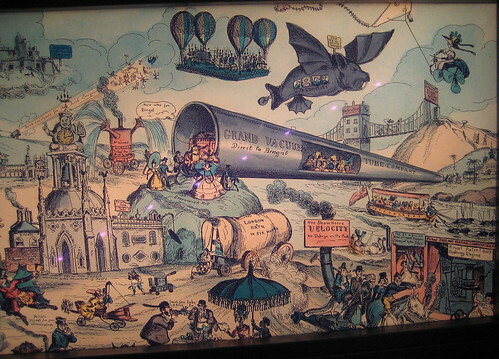 The above image is a cartoon so not meant to be entirely serious, but it's brilliant to see the cartoonist imagine the London Tube, or rather the Grand Vacuum Tube Company, going directly to Bengal from London. There's a wagon below the Tube predicting London to Bath in six hours. Also the futuristic Steam Horse Velocity meant "No sloppage on the road". If you look carefully at the flying pig in the air, you'll see that it's an airship full of convicts bound for New South Wales. Enlarge the picture and you'll see many other predictions for the transport in London. I wonder how many people will be looking at Transport for London's current plans for the system in 2012 in a 100 or 200 years time and shaking their heads or laughing? "I just watched the US season premiere of American Idol - we Tivo'd it a day earlier - and almost choked when Simon Cowell - ostensibly the best known Brit in America - couldn't remember what to call the London Underground. 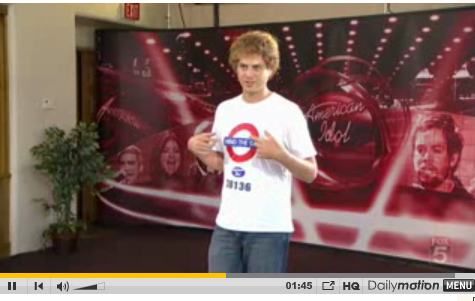 A young, blind contestant, Scott MacIntyre, came onto the show - the very last contestant of the two hour premiere - wearing a white "Mind The Gap" T shirt. During the interview he said he wore the shirt in honour of Simon. Cowell nodded for a moment and then said, "Oh yes, the subway right?". There was a little more to it but we were laughing so hard we may have missed it. Shaking our heads. Unbelievable. It was obvious he couldn't remember the name of "The Tube" and simply substituted the standard North American term. A copy should be sent to the Queen so she can start the process of revoking his peerage and citizenship, because regardless of the accent, he's obviously now a Yank." You can play the video here to judge for yourself, but maybe 49erDweet was being a bit harsh on Cowell, as he could have just been saying "subway" so the US viewers would understand what the roundel meant. Either way it's funny Cowell has become fairly Americanised. He probably couldn't even remember the last time he went on the Tube and maybe genuinely had to dredge the familiar symbol from the recesses of his mind. On Saturday I attended a fascinating event hosted by Penguin Books about books and "book-like" technologies called BookCamp 09. Regular readers of this blog will know that the future of reading & books is pet interest of mine. But it also seems like loads of you are also interested in it too - if the comments on a previous post on the Future of Books were anything to go by. Saturday's event was no exception either and it was great to be in a space filled with publishers, authors, writers, geeks, web people, agents, bloggers, illustrators etc all exploring what might happen to the book in the future and whether or how our experience of reading will change. Penguin Books have been a massive part of my life, as were their children's imprint, Puffin, when I was growing up. To me, they represent paperbacks & I still see loads of their orange spines & the familiar logo on my London Underground journeys. We were all kindly given a copy of The Penguin book of Penguin (pictured) above, which tells the story of the publisher and where it (and books) may be heading in the future. They've always been about spreading reading as widely as possible and it's great to see this includes an interest in non paper based books & online formats. Many people at BookCamp, I'm sure will be blogging and writing about the event. 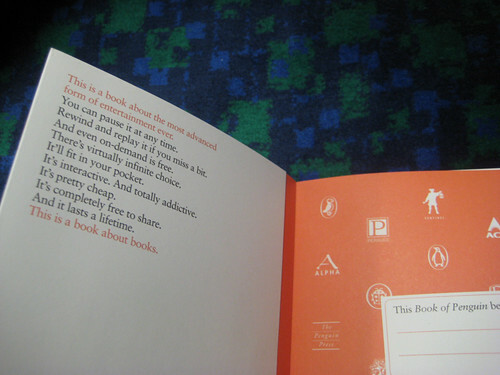 We may even see a physical book as part of the discussions. Keep an eye on the wiki and Penguin's blog for more. One of the sessions I found most interesting was on the future of children & books, led by fab children's author Alex Milway. We talked about whether children are reading more or less, what can be done (if anything) to make books capture short attention spans, can books ever compete with gaming, is gaming something that can help children read more or tell stories and whether any of this is important at the end of the day. As Cory Doctorow who was at this session said, much of what we see in the media is not really celebrating kids that ARE reading but it focusses on kids who are not – ie the reluctant reader. I don't see many teenagers reading books on the Tube - or rather I see a lot more adults reading books than kids. However, that's not to say they're not reading. Metro and free papers like the londonpaper seem to be really popular with teenagers. How much of that is to do with them being free or whether today's commuting kids are more interested in the news than escaping with a book, I don't know. Perhaps it's the bitesize "internet-like" format of tabloids that's important to them. However, as the dustjacket to the Penguin Book of Penguin says there's nothing about books to really stop them from being one of the most advanced forms of entertainment we have. Books can be paused at any time. We can re-wind or replay them if we miss a bit. There's infinite choice, they're free to share, a lot of them fit in our pockets & they're pretty cheap to run! The more this "interactivity", fun and "shareability" is promoted, the more chance we'll have of reading continuing and not being a lost art to future generations. Whatever happens, the book in its physical paper form or in an ebook or other digital format isn't going to go away. 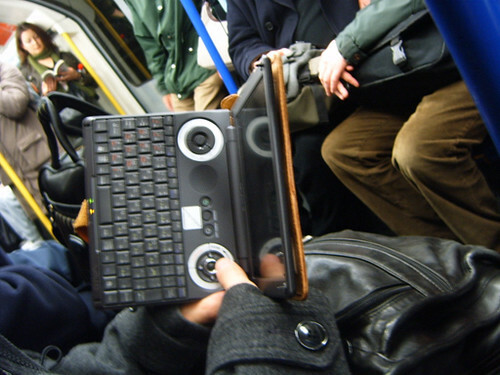 Perhaps in the future I might be seeing fewer paperbacks on Tube journeys, but until e-readers and electronic books come down massively in price, I don't think that will be any time soon. 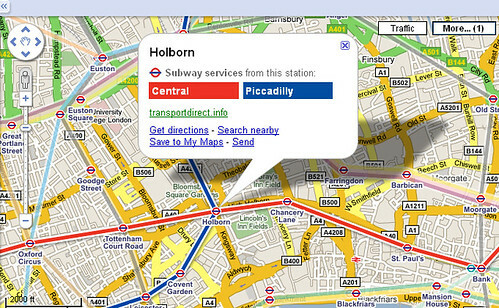 If you use Google Maps you can now get a fairly handy 3rd party app which gives 50 major cities an overlay of public transport such as buses, trains and includes the London Underground. vinf says "Would be especially useful if this would work with the Blackberry Google Maps application that I use all the time but I can't see a way to do that, overground rail networks and maybe bus routes would also be useful - but that would need a bit of detailed input from TfL (Transport for London) I would guess." Thanks to McBazza and Simon G who both gave me the heads up for this. 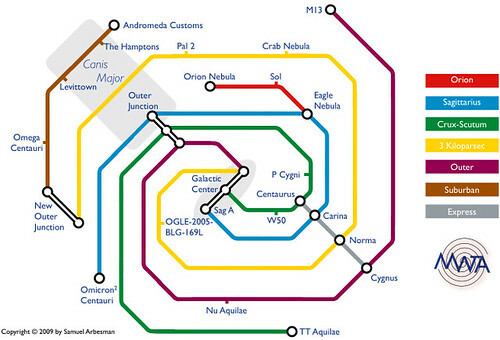 Speaking of Tube maps, chichard41 sent me a link for the Milky Way Transit Authority, which as been inspired by the London Underground map. The designer Samuel Arbesman says "This map is an attempt to approach our galaxy with a bit more familiarity than usual and get people thinking about long-term possibilities in outer space. Hopefully it can provide as a useful shorthand for our place in the Milky Way, the 'important' sights, and make inconceivable distances a bit less daunting. I have attempted to actually make this map as accurate as possible, where each line corresponds to an arm of our galaxy, and the stations are actual places in their proper locations. However, I am not an astronomer or astrophysicist, so there are certainly inaccuracies, gaps, and room for improvement." This is a great representation, but I wouldn't fancy trying the walk from Centaurus to Carina no matter how close they look on the map! Airwave is across all of the London Underground from today. Before you worry that it's a huge advertising campaign from Wrigley's chewing gum, it's the roll out of a secure radio network for emergency services. The system had already been used above ground, but has now been rolled out across the network of tunnels and 125 below-ground Tube stations. Policing Minister Vernon Coaker announced the service this morning and will visit Westminster London Underground Station later today to see the Airwave system in action. 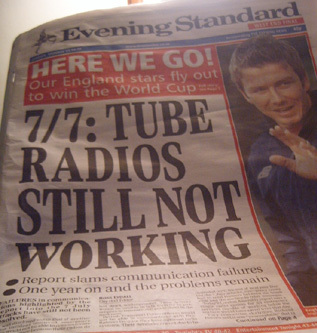 The launch follows a London Assembly report in 2006, which said said poor communication hindered emergency services after the 7 July 2005 bomb attacks on London's transport system. Airwave has actually been rolled out five months ahead of schedule in a £115 million deal. It will help police on the Tube respond to major incidents wherever they are on the network. The Policing Minister said: "The Airwave system plays a vital part in keeping passengers safe. It allows police officers to communicate with each other quickly and safely to ensure an effective response to any incident. "I am very pleased to announce that the system is now fully functioning ahead of schedule, helping frontline officers build on the excellent work they already do to tackle crime. "Crime is down on the Underground and with the roll-out of Airwave, passengers can feel even more confident that every effort is being made to keep them safe as they travel around the Capital." Tony McNulty, Minister for London said: "One of the key lessons from the London bombings of 2005 was the need to enhance the resilience of responders' telecommunications systems and communication underground. I am therefore delighted to see that this system is now fully in place, ahead of schedule, with the result that London is even more resilient and better prepared". Airwave now "piggy-backs" onto a London Underground digital radio system called Connect. So the British Transport Police, no longer need to carry two radios - one for above ground, one for below. This is all great news however, there are some concerns about whether the police network will be able to cope with demands during the 2012 Olympics when they are hosted here. Apparently the network "struggles" when a large number of users are concentrated in the same area. A security source told the BBC the system could collapse as demand is expected to increase in 2012 by 25-30%. Also at the moment, Airwave is only available to the police. Roll out to all ambulance staff is still taking place and fire crews have a system they say works underground and is inter-operable with Airwave. However, not all crews have been given access yet. 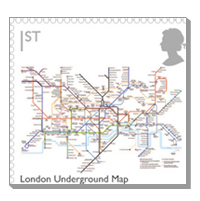 This might be the smallest mass reproduction of the London Underground map we've seen, as from today the Tube Map will be featured on a new set of stamps. Thanks to the brill Version 3.1, I learnt that the Tube Map (and the Routemaster) are two of the British Design Classics featured on Royal Mail's latest Special Stamp Issue. You can order a first day cover set of the stamps today for £4.61. If you miss ordering on the 13th, there's also a presentation pack (for £4.10) which explains what makes each stamp a design icon. 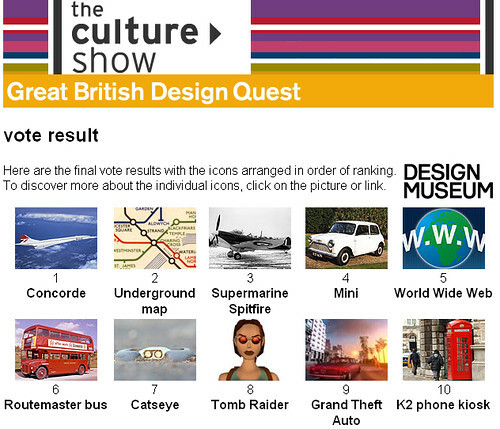 It's good to see the Tube map on a stamp as an enduring example of classic design, specially as it came second to Concorde a few years back, when the BBC Culture show, held a vote for Britain's Best Loved Design Icon. I imagine, that Harry Beck would have been proud to see his map with the Queen's head on it, even though you'd need a hefty magnifying glass to read the map! "The cosmopolitan line up of talent ranges from north Americian to British and European artists, including Austin Cooper (pictured above), McKnight Kauffer (pictured below), Tom Eckersley, Maurice Beck, Man Ray, Laszlo Moholy-Nagy, Julius Klinger and Hans Schleger." 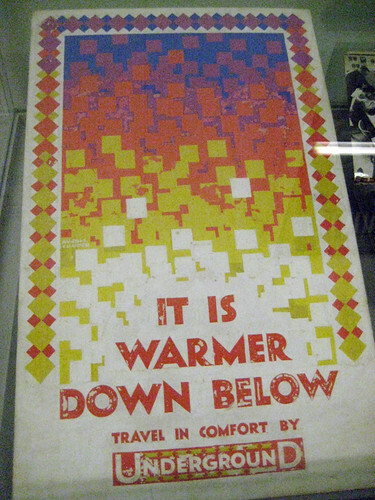 I love these Art Deco posters. 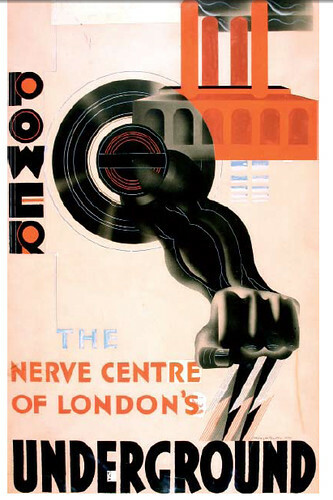 The Power poster by McKnight Kauffer is really typical of the industrialised style at the time. You can see the subtle use of the Tube roundel in the wheel which makes up a powerful forearm with electricity running through the veins. Many people think that the power station in the top right corner is a drawing of Battersea Power Station, but it hadn't been built in 1930 when the poster was drawn. "Pictures with a sting: the interwar modernist poster" starts at 6.30pm and will last for an hour. Tickets can be pre booked on 020 7565 7298 and cost £8.00 adults; £6.00 concessions; £4.00 students. Full details are on the London Transport Musuem's website. I was interviewed by Londonist over the weekend as part of their new series featuring London bloggers. The final question they asked me was whether I'd ever been sick on the Tube. I thought, that's a cool, yet yucky question for me (although later found out it's one of their signature questions). Thankfully, I've never been sick in a London Underground carriage. Although you can see my full answer in the interview here. Fortunately I've never seen anyone throw up inside a Tube carriage, which is surprising as I travel around quite late & in trains where there's been much drunkeness. Even on the final Circle Line party before the ban on public transport booze, I didn't see anyone puking there. 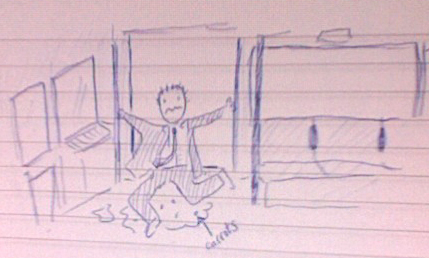 However, I remembered that Marie F aka Tiger's Hungry, drew a little cartoon to illustrate what happened after she saw a woman throwing up on the Piccadilly Line one night. "After an initial few moments of gawping most of the carriage quickly herded down the other end covering their mouths and offering the occasional insightful 'oh that's gross' - but I was happy to see other sympathetic travellers fumbling in their bags to offer her tissues (to her testament I think it was genuine 'not wellness' to blame rather than booze). She quickly departed at the next stop leaving a gaggle of tourists scrabbling to relocate their sick laden luggage. "Yes the smell was bad for me, but at least it wasn't as bad as enduring what happened to the poor guy who got on at Holborn. Hastily boarding the carriage he lost his footing and after a few moments scrabbling about in the mess ended up on bended knee in the epicentre of events. To quote the experience in his words 'Oh f**ing lovely'. Yet he still valiantly took a hit for the team and stayed on the little end of carriage perch to warn fellow boarding travellers of the perils that lay within - and thankfully there was only a few future slippy near misses. 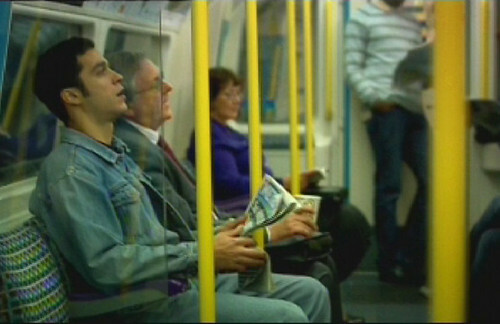 Marie also pointed out that Armando Iannucci's Tube Tales 'Mouth' segment came to mind quite vividly. For those of you who aren't eating, you can see the short film below, which is a pretty colourful view of a late night Tube trip. 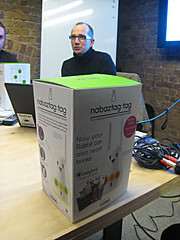 Err, welcome to blog Londonistas! Many people have held private fancy dress parties where you have to come dressed as a Tube station. That doesn't mean you cover yourself in crisp packets, graffiti, advertising posters and have a pigeon under your arm. You dress up as something that sounds like London Underground station name. 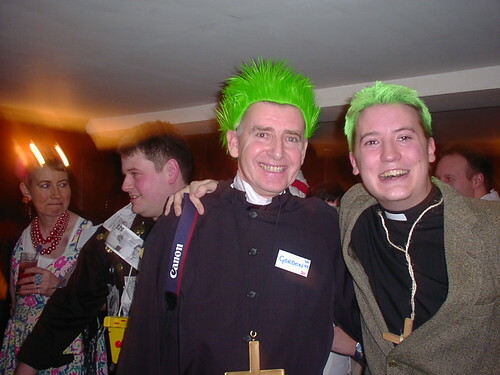 However, I've just learnt of a public Tube fancy dress party on the 31st January. It's organised by Bringstuff who say "We want you to come dressed as a visual interpretation of a Tube station - a blacksmith with a large hammer for Hammersmith, a manchester clown for Piccadilly Circus or James Bond for Bond Street etc"
"You get the idea, so be as creative as you can, with one exception. NO ANGEL COSTUMES - Angel Islington is off limits as it would be rubbish if everyone turned up in the same costume. " Full details are on their website & entry's free before 10pm. If you're looking for ideas for Tube Fancy Dress party costumes, there's lots in the comments of the aforementioned post, or you might want to suggest some of your own. I might be tempted to go along covered in mouldy ham representing a station I change at a lot on the District Line. Although that's a tad unsociable, so I'd probably dig out an old duffle coat, grab a small suitcase & a jar of marmalade and learn Peruvian for the evening. Following on from yesterday's post on the London Underground's green products, I came across an interesting story on Current about an energy saving subway station in Tokyo. 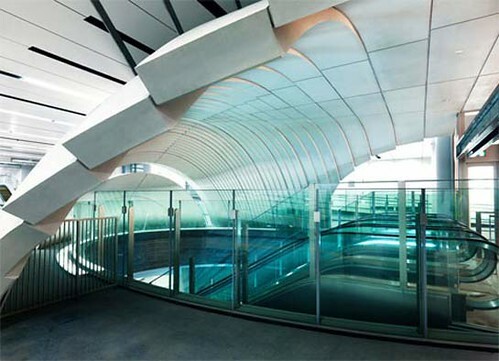 Tadao Ando, the designer of Shibuya Station, told Wallpaper magazine "It's composed of a central void contained inside an egg-shaped shell and aims to reduce the station's dependency on air conditioning equipments by letting the outside air blow into the underground space, creating a natural ventilation system that is energy saving." As the London Underground has very little dependency on air conditioning equipment (mainly because it currently doesn't have any - apart from comedic giant fans), I doubt whether we'll be seeing this in London any time soon. 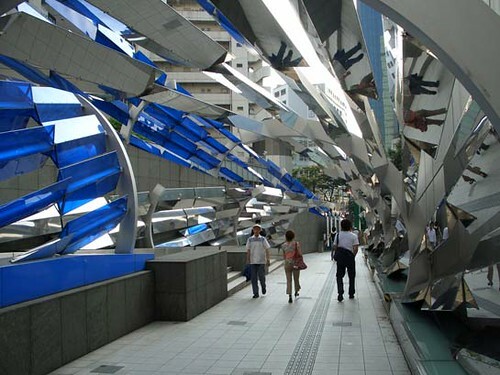 "The existing underground stations in Tokyo are generally very confusing, generating a sense of disorientation, making it very difficult to find your way and getting around. This is due to the fact that it is very difficult to recognize your own position in relation to the street level's world and in addition to the constant shift of direction you are forced to make in the labyrinthine underground world. In order to help people's orientation in this underground world, giving them a sense of spatial perception and improving the functionality of the station, I created a 15 metre central void from concourse level B2 to the platform level B5, and wrapped it all up within a symbolic egg-shaped shell." The station design looks amazing although not sure what the mirrored parts would do to my sense of spatial perception. Environmental blog Planet Green n Pink said "The idea behind the design was to keep a continuous flow of energy moving smoothly. That translates to a positive experience for the traveler and very good Feng Shui." Good Feng Shui & a positive energy experience on your commute, please can have some Japanese design on London's Tube stations. Looks like the London Underground are doing their bit to help people get a little greener with some new products launched for their shop. Mags put me on to these Envelope Angels after seeing them as a Secret Santa gift in I like. "They're labels you stick over the address on a used envelope to make it shiny enough to use again. They come in two models, original angelic and London Underground issue (above). They're really nicely designed - the box acts as a dispenser which you can refill, and Blue Marmalade, the people who make them are so nice they'll even recycle the plastic stickerbacks for you." 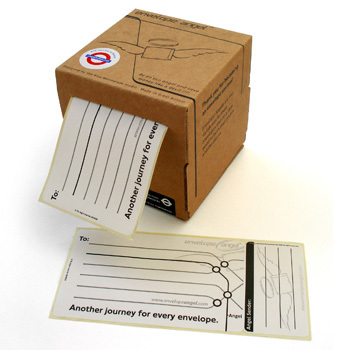 The Tube one is illustrated with a stretch of the Northern line leading to Angel station, and carries the slogan: 'Another journey for every envelope'. Hopefully it's a better journey than an average one on the Misery Line! They're only £5.86 for a pack which contains 100 "To: Labels" and 100 "From: labels". 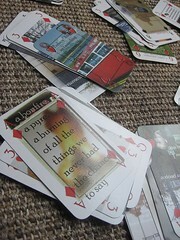 The company's tip is to include a label pair within each envelope you send and pass on the idea to those you mail. Blue Marmalade also make some very cool looking pendant lampshades. 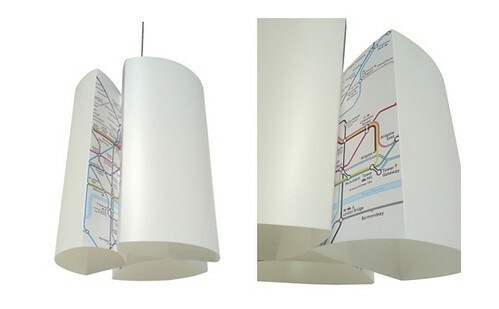 They're made from single sheet of recyclable material and when they light up reveal the Tube map illuminated in their folds. The lamps which are £24.27 come in Classic styles (for high ceilinged rooms) & Intimo (for more intimate settings!). They can be used with energy saver bulbs and bulbs up to 100W. Apparently the fold-out design means there's not much waste during production and the material is also recyclable. Based in Edinburgh, Blue Marmalade aim to be as green as possible, and say that harmful chemicals and manufacturing processes are removed from their designs. 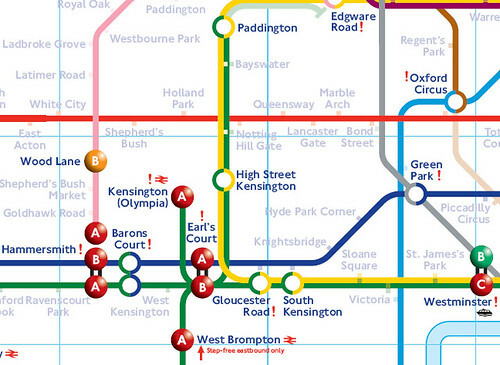 Trent Jennings from the company said: "The Underground map represents British graphic design at its best; it has strong functionality but also great visual impact." I think it's a great idea for a lamp and I'm sure it will be gracing my lounge very soon. Later on today I'll be live on BBC2's Working Lunch talking about the future of blogging. Not sure if I can trust the BBC's laptop to do live blogging this time, but it's nice of them to ask me on again. Thanks to everyone on Twitter yesterday who responded to my plea to borrow a crystal ball & give me their thoughts on the future of blogging. You might have heard about the death of blogging or probably more accurately the rise of microblogging (like Twitter, videoblogs & Facebook status updating), but I think it's just mainly a case of blogging growing up and becoming mainstream. 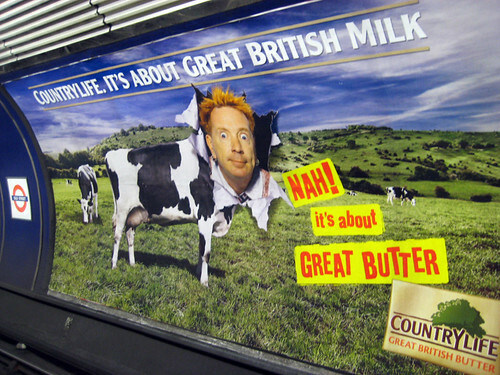 Like Johnny Rotten advertising butter, blogging's become less "subversive" or "rock n roll" and more mainstream. With the millions of people who blog now, that's bound to include people (and businesses) who blog for difference reasons and financial gain is bound to be one of them. Ultimately that's going to get lots of early adopters or people who started blogging five or six years ago (like myself) muttering into their keyboards, saying "Ah blogging's not what it used to be" or "Blogging's rubbish these days, with companies and brands getting on board". But for me it's doesn't have to be a case of doom & gloom. True there are now millions of blogs but readership of blogs isn't falling. What will probably happen is that numbers of blogs will continue to rise, but the lifecycle of those blogs will be much shorter. In the past to make a blog "work" (whatever that means) all you had to do was have one. But now with millions of blogs competing for attention it takes time, effort, engagement with the people who read it & evidence of some passion & interest in what you're doing. Otherwise, you'll get bored, your readers will certainly get bored, people will stop reading & linking to your blog and you might wonder why you do it. That can be said for anyone who blogs - small businesses, brands, personal blogs, celebrities or journalists. 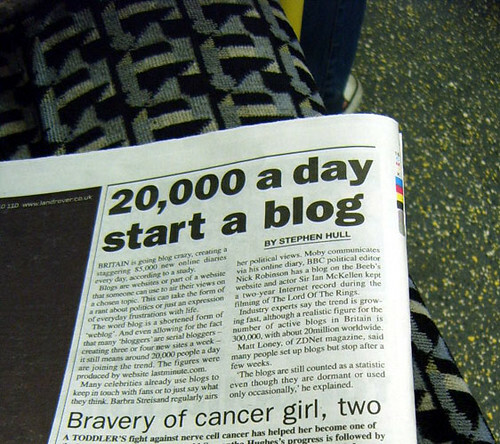 Some blogs are influential and can touch a nerve (when I started blogging in early 2003 I never expected TfL, Tube Lines, London Transport Museum & some of the London press would pay so much attention to this blog). Some bloggers can certainly give mainstream journalists a run for their money. If blogs are written well and have interesting content, they can help companies build a good relationship with their customers, but none of this happens overnight or in isolation from other online communication. Kevin Marks a software engineer at Google, used to work for Technorati (the major index for blogs) & wrote a post about the whole "death of blogging" debate which summed up what I'd been thinking for quite some time. "Blogging's not dead, it's becoming like air". He said: "the old blogging crew are still around, they're just blogging less than those paid to do so a dozen times a day. Not because they are less interested or engaged, but because there are now many new ways to do what we used blogs for back then." That's my thoughts for this morning, and they could well change by the time I get to the BBC! I'll update this post later with a link to the programme. I'll be joined by Robert McIntosh who'll be talking about how Twitter has helped his business. He kindly hosted a Twitter Wine Tasting at his house last year, where tasted wine & discussed it (in 140 characters or less!) with other Twitterers in the US. Again something I certainly never expected to be doing when I started blogging! It was interesting that at the end Simon Calver, Chief Exec from Lovefilm, who was also on the show, agreed with my point about companies needing to blog & use online communities to monitor what customers think about their services. If you're in the UK you can see our appearance on BBC iPlayer. You may have seen the news over the weekend that a baby girl was born at Kingsbury London Underground station in December, making her only the 2nd recorded Tube birth in 84 years. 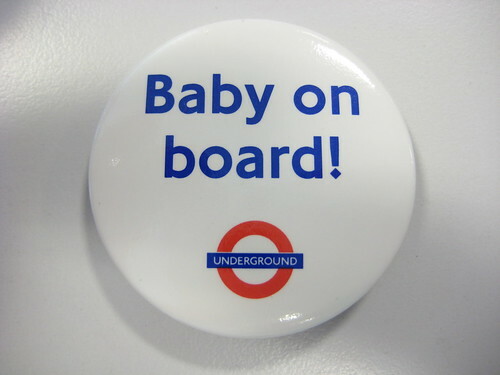 Transport for London said that there had only been one other birth recorded on the London Underground. The first baby was born at Elephant and Castle station in South London in 1924. 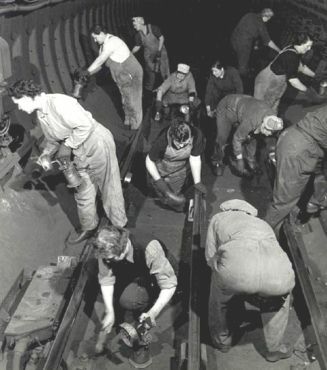 An urban myth at the time had her named as Thelma Ursula Beatrice Eleanor (her initials spell TUBE), but she was called Marie Cordery (or possibly Mary Ashfield Eleanor Hammond, after Lord Ashfield who was Chairman of the London Passenger Transport Board at the time). On the 19th December 2008, Julia Kowalska's waters broke on the Jubilee line and she got off the train at Kingsbury station but went into labour on the platform. A TfL spokesman said: "At 9pm the station supervisor received a message from the control room that a woman on a northbound Jubilee line train was complaining of stomach pains. A few minutes later the station supervisor went to the platform and found the pregnant woman having contractions and called an ambulance. "The woman, accompanied by her sister, was wrapped in a foil blanket to keep warm and taken to the supervisor's office, where the ambulance crew delivered a healthy baby." However, Jerry Springer says that he was born at East Finchley Tube station during an air raid in 1944. He's pretty famous, so how come he's not known as the second baby to be born at a Tube station? Or do people giving birth when the stations were used as air raid shelters not count? It's unlikely that we'll find out much more about baby Kowalska as some reports have her mother down as homeless, whereas others say her mother lived with her sister. I was hoping she might have Kingsbury or Jubilee as a middle name. It is amazing that more children aren't born on the Tube. I see some very heavily pregnant women travelling on the London Underground, and with all of the movement & overcrowding you'd think that would bring on more contractions. EastEnder's character Dawn (in the first picture) had her waters break on the District Line, & she was stuck in a tunnel. I thought that would be the first fictional Tube birth. But they rushed her to hospital in the end. So it seems unlikely that you'll have to use any midwifery skills on the Tube, as Tube births are apparently few and far between.